Morganton, NC. 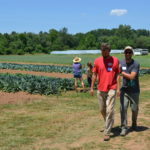 But, our members were not deterred by the heat. 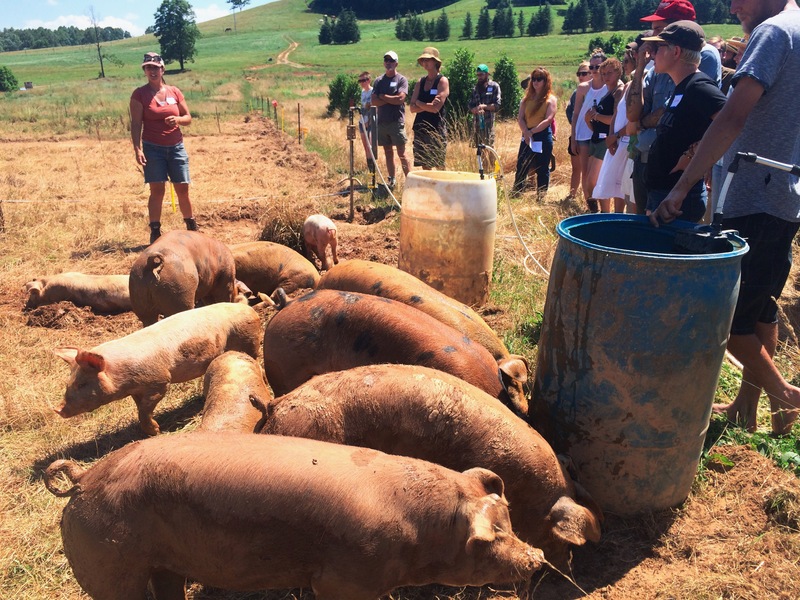 Our focus for this CRAFT tour revolved around the “Magic of Observation: Livestock and Plants.” William Lyons and Marie Williamson, the co-owners of Bluebird, walked us through their farm enterprises helping us build our skills in monitoring and observation. 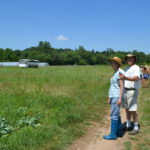 William and Marie moved back to Marie’s hometown and started their farm in 2009, after spending several years working on farms across the country. 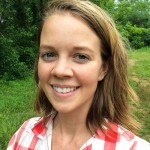 They chose to come back to Morganton because resources and support of family and friends that they could tap into during their startup years. 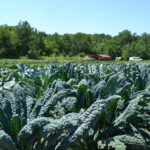 Marie’s father has some land to get started on, and they came across the land where they have the bulk of their production through a lifelong family friend who is transitioning out of the nursery business. 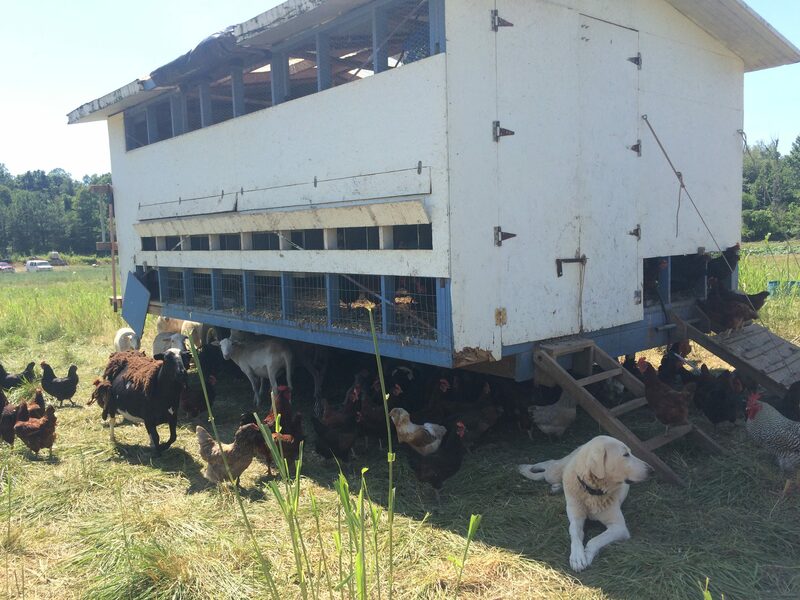 Seven years later they have refined their enterprises and developed an integrated vegetable and livestock operation – raising A-Z vegetables, pigs, sheep, broilers, and laying hens. Assess your results, and REPLAN. 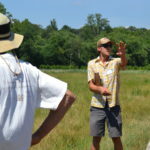 Learning how to monitor your farm and building your observation skills is an important process in itself. How do you know when your field is too wet to plow? What direction do the storms coming from? 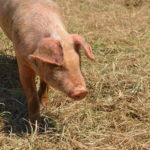 Is your animal in heat? Why are the leaves wilting? 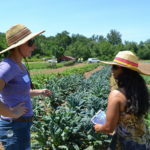 These are all questions you’ll be faced with at some point so getting to know your land, its nuances, challenges, and tendencies are necessary to getting your work done each day. 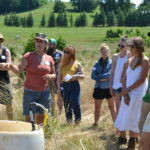 And stemming from that, learning how to communicate what you observe is especially paramount when working with partners, employees or other stakeholders in your farm, Marie explained. 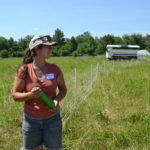 Marie then went into a little more detail about how those observation skills pertain to rising livestock in particular. 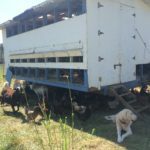 All livestock care has four main components that it is the farmer’s job to manage: water, food, health and shelter. And, William explained that those ring true for all living creatures – plants included (although shelter a little less so). And, this process of observation and monitoring is never over. You can’t determine that a bed of potatoes looks good, and then leave it alone for another month. 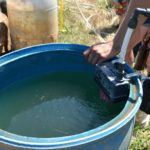 The variables that affect an animal or plant’s access to water, food, shelter, and health are ever changing day to day. As a way to test our observation skills we did some exploration in pairs of the farm trying to captures “pictures” and observations of what we saw. 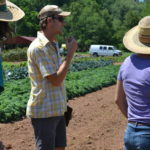 Then, we visited the different enterprises as a group making observations as we toured the farm. 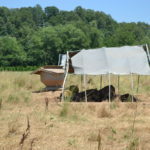 We checked out the young pigs and saw them all piled under one shade tent, where they just installed a water sprayer, to keep cool. 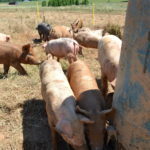 When they check on the pigs they always make sure the water tank is full and flowing well and that the feed containers aren’t clogged or tipped over. They also consider the health of the pigs: what does their manure look like; are they getting sunburned; or if there are any illness/injuries in the bunch. They observe the land, too. 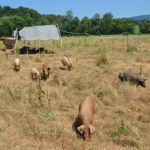 The pigs’ role on the farm is to help reclaim overgrown parts of the fields, turn it up, and add nutrients to the soil as they convert their feed into manure. 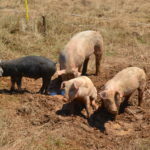 But, pigs can damage land if left in a paddock too long so Marie and William have to judge how long they will stay in one place before moving them again based on the impact on the land. 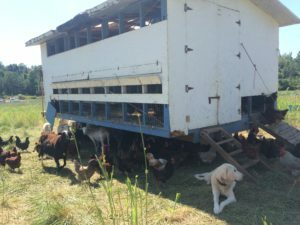 Our next stop were the sheep and laying hens which are well protected by their Turkish Akbash guard dog. 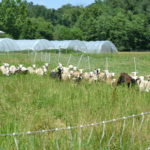 As we approached the sheep started circling the chicken house, and Marie pointed out that the sheep at the head of the line is the top ewe in the herd. Understanding herd dynamics can help you manage your flock. 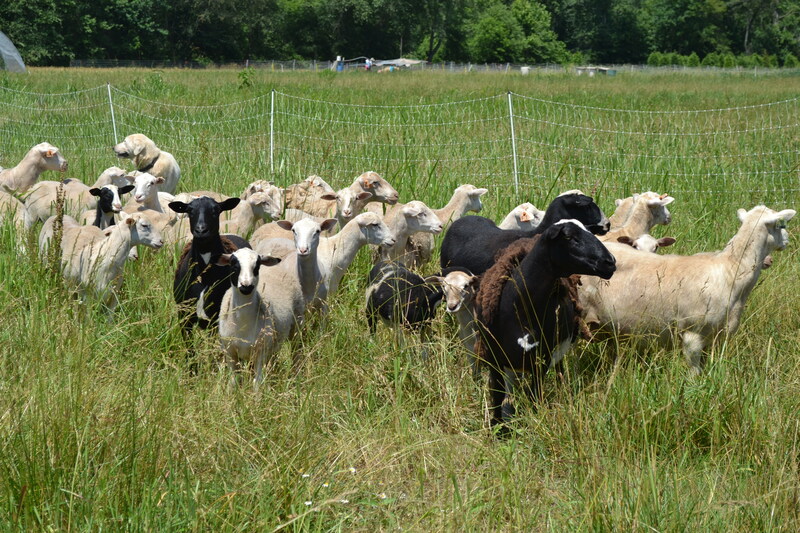 Marie has also had to calibrate herself to look at a piece of pasture and judge how long the flock can stay on a section before they need to be moved again. 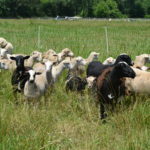 To determine this she takes a variety of factors into mind including, the number of sheep, the season, rainfall, temperature, current length of the grass, size of the section, etc. 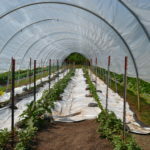 Then we moved on to the vegetables where Marie and William use hay groves as three season covered growing space, and we could really feel the heat pumping out of those tunnels. 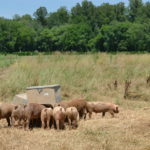 Their fields are close to the creek and there is a berm built along the edge of the field to help protect the field when the creek floods. But, the berm is also great groundhog habitat,and groundhogs can do some costly damage to crops. So, Marie and William have had to become expert groundhog capturers. The soil is also more sand than loam. 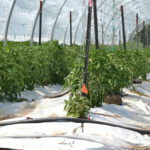 It dries out and leaches nutrients quickly so they bring in compost to build organic matter, and are using white plastic to help keep moisture in the soil and reflect some of the heat. Speaking of heat by this time we were all feeling a bit wilted ourselves. It was time to gather back in the shade and enjoy the potluck. 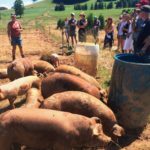 A hearty thanks to William and Marie for leading an excellent tour and sharing their insights into building your on-farm observation skills.